Gentlemen prefer girls who know how to cook, whether they be blonde, brunette, or titian. The cookbook is organized alphabetically by actor name. 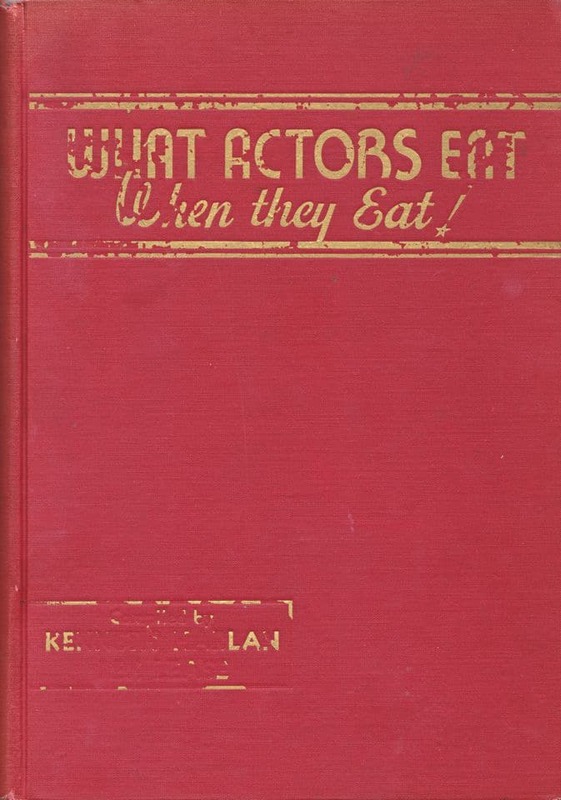 Each entry contains a headshot of the actor, a brief biography and a recipe—either a family recipe, or a favorite dish the actor enjoyed. There are some terrific actors featured in this book. While several of the recipes are outdated and over-processed, it is a fun glimpse at the time period and taste preferences of some cinematic greats. I hope to cover other stars and recipes in future posts. Today, I’m sharing a recipe from one of Hollywood’s legends—a romantic and charismatic leading man who was born with a very unsexy name, indeed. On January 8, 1904, Archibald “Archie” Alexander Leach was born to a working class family in Bristol, England. 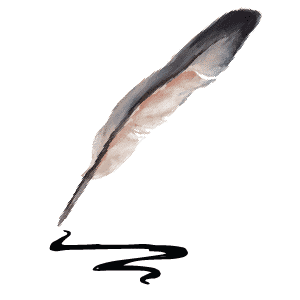 His parents, Elias James Leach and Elsie Maria Kingdon Leach, had very little money. They spent a great deal of time arguing and struggling to raise their son, an only child. In order to escape the difficulties at home, young Archie spent Saturdays at the “picture palaces” watching matinees and discovering a love for film and acting. When Archie turned 14, he decided to take a chance on acting. He joined the Bob Pender Troupe, a traveling performance group also known as the “Knockabout Comedians.” He acted in pantomime and performed tricks as a stilt walker and an acrobat. After a successful tour of small English towns, the troupe went to New York, where they were well received. After two years, Archie decided to make America his new home. He did a fair number of odd jobs before earning his first stage role in the musical Golden Dawn. It was the beginning of a theatrical career, which eventually led to an audition with Paramount Studios. Grant’s greatest talent was comedy, which he treated with a light, natural ability. His success was undoubtedly helped by his charisma and dashing good looks. He appeared elegant and sophisticated, so different from the working class English lifestyle of his childhood. 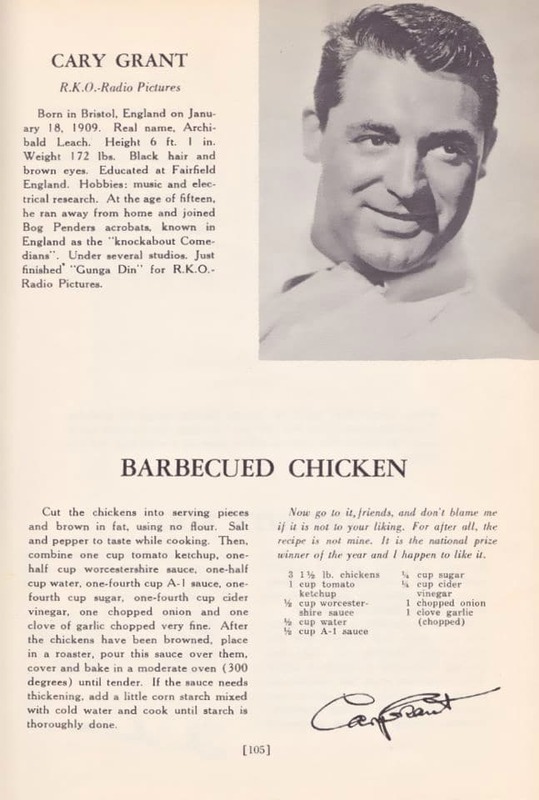 Cary Grant Barbecued Chicken Recipe, Biography and Headshot from What Actors Eat When They Eat! I made the recipe, and it is pretty good. I used one 4.5 pound chicken, rather than the recipe’s suggested 3 chickens, 1.5 pounds each. I increased the oven heat and baked it for a long time to ensure the chicken was well-cooked and tender. I also thickened the sauce a bit as suggested by the recipe’s liner notes. 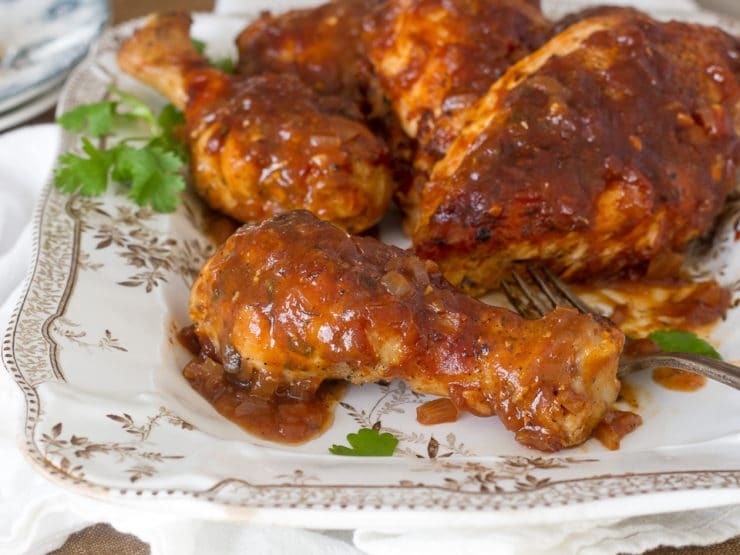 The recipe produces a LOT of sauce, but it isn’t really a problem, since it helps keep the chicken moist and tender as it cooks. Next time I might cut down on the vinegar a bit; that is a personal preference, though. It’s a simple and homey recipe, just right for a cold autumn evening. 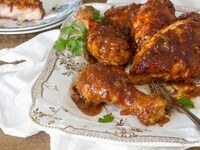 Cary Grant's Oven-Barbecued Chicken - Learn to make one of Cary Grant's favorite recipes. Preheat oven to 325 degrees F. Heat olive or vegetable oil in a large skillet over medium till hot. 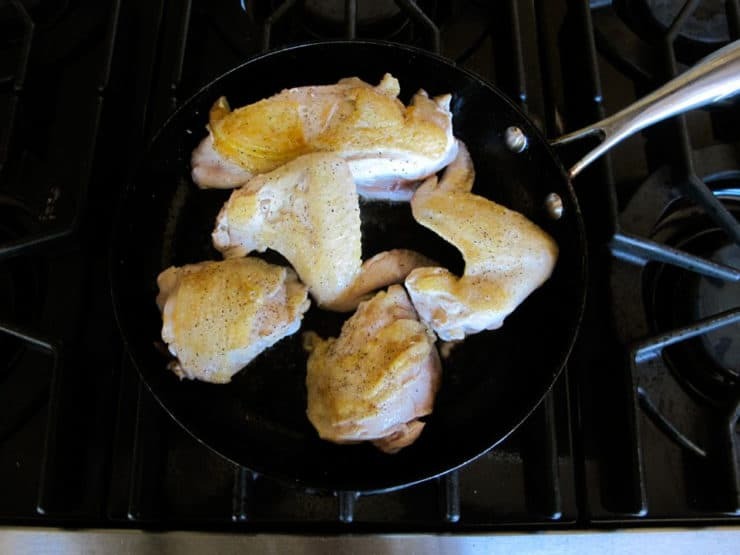 Fry the chicken pieces in the hot oil in batches till browned. Season with salt and pepper as you cook. 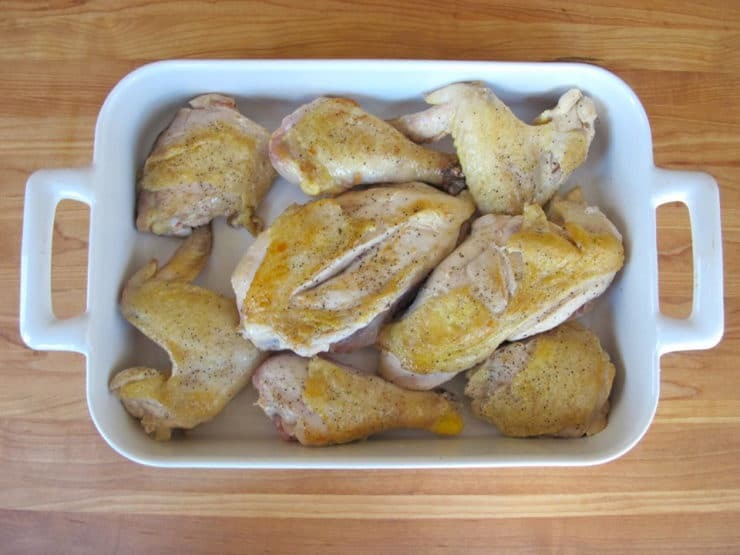 Place browned chicken pieces in a 9x13 baking dish. 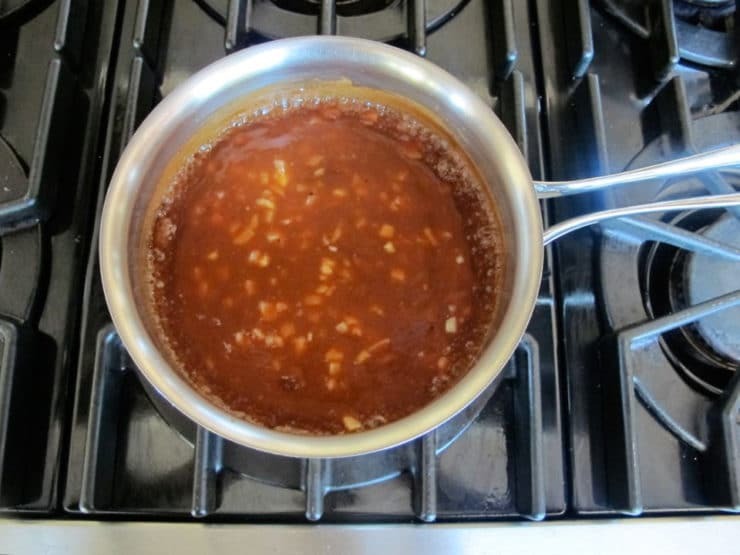 In a saucepan, combine ketchup, Worcestershire sauce, water, A-1 sauce, sugar, cider vinegar, onion and garlic. Whisk together over medium heat till warm. In a small bowl, whisk together 2 tbsp cornstarch with 2 tbsp cold water till smooth. Slowly add the cornstarch mixture to the barbecue sauce, whisking till incorporated. Continue to whisk over medium heat till the sauce is hot, bubbly, and thickened. Remove from heat. Pour the sauce evenly across the top of the chicken pieces. Cover the roasting dish with foil. Bake the chicken for 60-75 minutes, or until the meat is tender and well cooked. Remove from the oven. If you’d like to serve extra sauce with the chicken, skim the fat drippings from the top of the sauce. To thicken the leftover sauce, pour it into a saucepan and heat over medium. Mix together equal amounts of cornstarch and water, a half tablespoon at a time, and slowly whisk into the sauce. Heat and add the cornstarch mixture, stirring constantly, till desired consistency is reached. 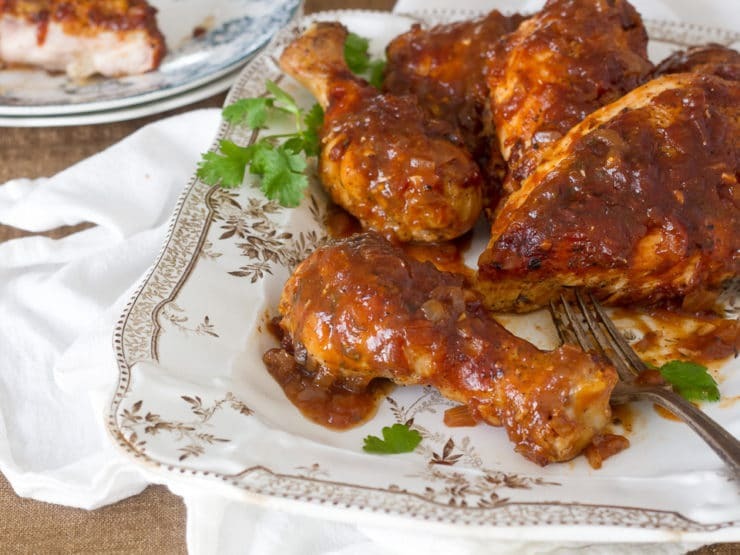 Serve chicken warm with the thickened barbecue sauce on the side. Lease, Rex and Harlan, Kenneth (1939). What Actors Eat — When They Eat! Lymanhouse Publishers, Los Angeles, CA. McCann, Graham (1996). Cary Grant: A Class Apart. Columbia University Press, New York, NY. Nelson, Nancy (1992). Evenings With Cary Grant: Recollections In His Own Words and By Those Who Loved Him Best. Thorndike Press, Thorndike, Maine. 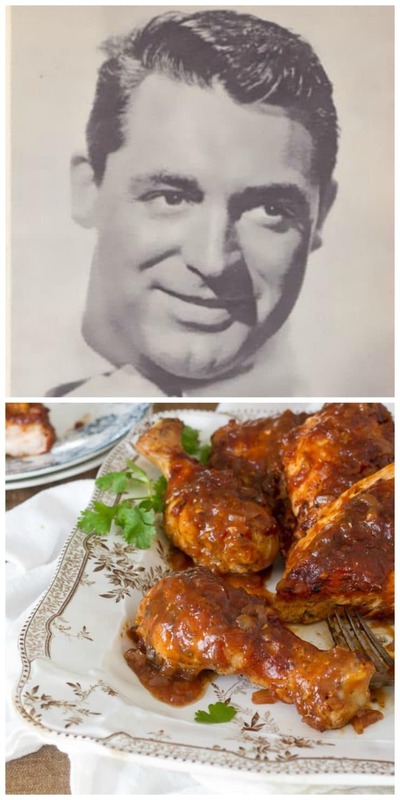 Thank you so much for posting Cary Grant’s Oven-Roasted BBQ Chicken! I loved Cary’s films and now l love his favourite chicken too! I followed your pictorial and thickened the sauce in the saucepan with the recommended 2tbsp cornstarch and water. When the chicken was cooked l poured off the sauce and rethickened with an additional 1 tbsp cornstarch and water. I also followed your recommendation to cut back the apple cider vinegar a bit. This chicken just fell apart and that sauce is a good thickness and delicious. My husband agrees that this is a keeper. I saw in the cookbook bio that Cary Grant shared this recipe right after filming Ganga Din. That would have been in 1939! It’s also astonishing to discover that A1 Sauce has been sold since 1831! Thanks for sharing such a special recipe that clearly stands the test of both taste and time. Cary Grant was my favourite actor Marja! Never missed a single movie of his. North by northwest, notorious, Gangadin, charade, topper etc. etc. I love classic film, too! That cookbook looks like a fun find. I’m glad you shared this recipe. It will be fun to make something that Cary Grant recommended. Swoon-worthy. An Affair to Remember will always be one of the best. I just made this last weekend… I did doctor up the sauce a bit though. I like spice! I loved him wow!! That makes me feel old! What a funny, handsome guy. Hope he is having a great afterlife. Goood looking man, great actor, funny man. Such a life that was sad he gave so much joy. It is The Actor. I had such a crush on that man! Making this recipe tonight! Yeah, total hunk.. and so graceful. He could move across the screen like no other..
What is A1 sauce? We haven’t got it in England? Anton A-1 is a steak sauce that is quite popular here in the U.S. It is difficult to find in Europe, however you could substitute HP sauce, which is widely available in the U.K. (and also throughout Europe, I think). I grew up with A-1 sauce, got to try HP last year, and prefer the latter. HP is close only a little sweeter. I’d give that a try, and you might add a tsp or so tamarind paste as it’s a darker, heavier sauce than HP. Give it a try! Yummm that recipe sounds good. On the to do list now. I came across your page thanks to Nigella’s tweets. I am Italian, so could you please help me understand what A-1 sauce is? Should it be a product only available outside my country, would you mind suggesting me something similar? Hi Monica, A-1 is a steak sauce that is quite popular here in the U.S. A-1 is difficult to find in Europe, however you could substitute HP sauce, which is widely available in the U.K. (and also throughout Europe, I think). I would LOVE to have that book, but it’s $100 on Amazon. Maybe if I look around,…Definitely loved Cary Grant and his movies, and I look forward to trying his recipe. Also looking forward to you sharing other actors’ recipes with us. If you keep kosher there are kosher Worcestershire sauces without fish, such as the Gefen brand. 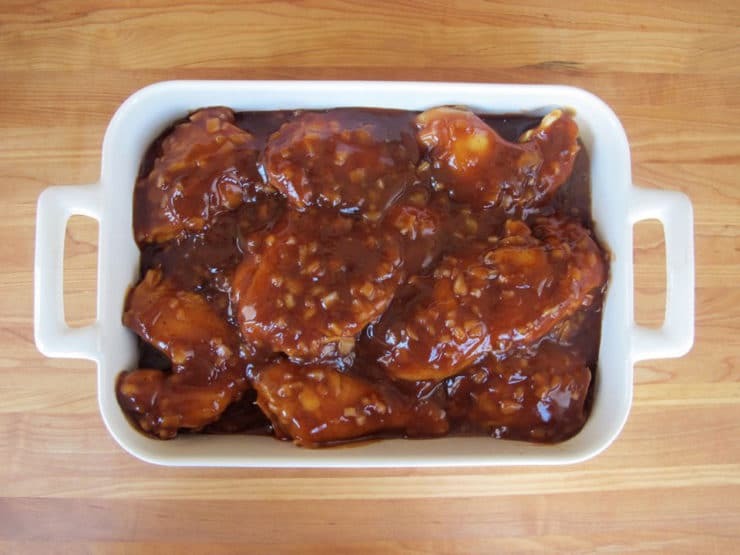 This sauce was very similar to another recipe I have used forever but I decided to use this version of the sauce on ‘wings’ and it was finger lickin’ good. I tried this for dinner, my husband said this was “THE” best. I will definitely make it again, thanks so much !! Fabulous! Happy you (and husband) enjoyed it! I keep kosher, Worcestershire sauce has fish in it. What can I substitute? Fish is parve. Worcestershire sauce, w/fish as an ingredient, should be fine on chicken. Lisa, you can just omit the Worcestershire, there will still be plenty of sauce for the chicken without it and the flavor will be fine. If you want, you can add an extra 1/4 cup of steak sauce to the mix. Rebecca, it’s true that fish is pareve, however some Orthodox or strictly kosher Jews will not mix fish and meat– they require the mouth to be rinsed between consuming fish and meat. That said, the majority of Jews who keep kosher have no trouble mixing meat and fish, as you’ve noted. For those that do follow this restriction, the recipe can easily be modified as stated above. I love Cary Grant, I watch his movies and totally crush (is that weird). He was so handsome and so charming. This was really fun, and I love the book. There is no garlic measure in your ingredients. Just FYI. Thank you. Now I know what to make for dinner. My boys will enjoy. PS North by Northwest is absolutely my favorite. Father Goose is pretty good, too.